It was the Cruinniú na mBád festival this weekend (‘the gathering of the boats’). 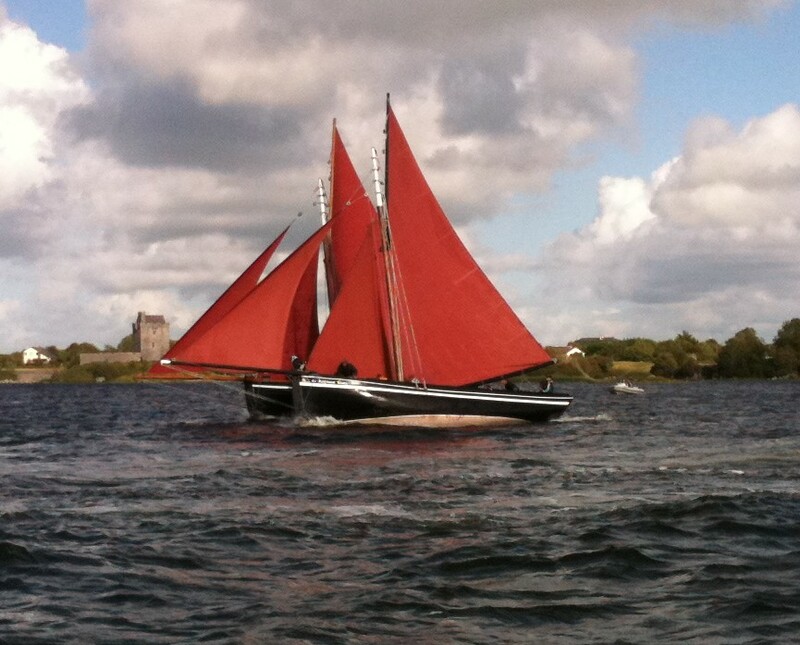 The traditional sailing boats ‘hookers’, some of them 180 years old and crewed by the same families for five generations, symbolically brought the turf from Connemara to Kinvara on Saturday, as they used to do for centuries, until the 1950s when the Bedford truck took over and they ceased to trade. The breeze was stiff for an exciting race on Sunday, out past Island Eddie into the choppy waters of Galway bay to turn around the buoy beyond Trácht beach. In the heat of the race these large sailing boats were tilting so far into the wind they were virtually taking on water, completely exposing their colorful keels on the far side. Only three years ago The Morning Star sank as one small error of judgment, a rope tightened or loosened at the wrong moment, tipped her too far over. All the crew were fished out to the safety boat and she was hauled up from the bottom a few days later. The Cappal (the boat nearest the castle in the photo) was the eventual winner yesterday after a hair raising battle. There was a full program of music at the festival with a stage on the quay featuring Jim McKee on Saturday, The Rascals and Sean Slattery on Sunday and plenty of traditional music. The grass along the water’s edge was bustling with stalls selling crafts and food; the guy doing the wood turning display in the main marquee was very popular every time there was a shower. There were also art and photography exhibitions, a fancy dress competition and a model railway of the newly re-opened Gort-Adrahan railway line. Other events were the climin (seaweed raft) race, the crazy raft display and an attempt to break the world record knitathon in aid of Somalia. On Saturday the Kinvara Minor hurling team, (my son in forward), played Kiltormer in the quarter finals. They won 7, 11 to 1, 13. It felt so right to see him in the purple and gold again and I was drowned in happiness (and rain) when he scored a goal and a point, especially having just recovered from a badly broken right wrist. The team, who have played together since age five, have always shown promise with excellent hurlers, but have a history of getting to the finals and then losing. This year, although they are young for their group, they are looking hot. It was heart warming to bathe in their joy on the way home and a good night to celebrate in Kinvara with 23 bands listed throughout the pubs over the weekend. So on to the semi final..